We are pleased to announce that Affinity Publisher build 221 is now available as a manual download from the link above. All being well we will put it on auto-update early next week. - Text > Insert Text from File has been removed and File > Place should be used instead. The types of files available via File > Place depends on context, for example if a Text Frame is selected then text files will be made available. I'll download later, read the long description again and start playing. Great news about the Master Page's Text Frames. Now I just have to unlearn all the oddball workarounds I have developed. Crashes when I select a line of text, hold down the shift key, and press an up or down arrow to select more lines of text. Please start a new Bug topic, this won't be seen here as easily as a new topic would. 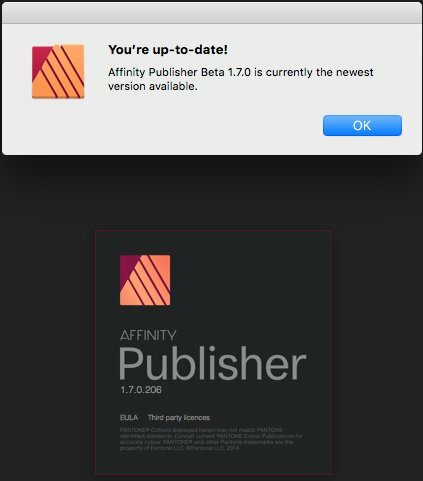 I always get this dialog when I try this version "Affinity-Publisher-Beta-1.7.0.221.dmg". Is the date set correctly on your computer? That suggests they haven't updated the self-update feature yet. You will need to download it from the link at the top of this thread in the meantime. Nah I can wait, no hectic. I prefer the update feature and less download sizes here! Thank you, thank you, and thank you once again! Thank you so much for this video. It really explains the new Master Page feature in the latest public beta. I have one question though. Once you detach a Spread frame from the Master Page, edit the text frame or other items on the spread and you click finish, does it then re-attach to the Master Page? On other words, is the detach feature a one-way progress? Any further explanation would be greatly appreciated. This build has been superseded by Build 227 and this thread is now locked. That's correct, it is not possible to relink detached attributes of unlinked master page items. You would have to re-apply the master page. Feel free to make a suggestion in the suggestions forum if you feel that is a significant limitation.